I recently developed a whole new appreciation for papaya, a tropical fruit that I used to find quite bland in flavor and had all but ignored. Here in Florida during the winter, mangoes and papaya seem to be everywhere so I decided I needed to give papaya another try. At the market where I bought my papaya it was recommended that I use lots of lime to bring out the flavor. Strangely enough, I found that not only did the lime did improve the flavor, it really brought out the natural sweetness of this tropical fruit as well. It wasn’t until I went online to do some research about papaya however, that I found out it really is an exceptionally nutritious fruit. Papaya fruit is packed with numerous nutrients, and is one of the favorites of fruit lovers for its nutritional, digestive, and medicinal properties. The papaya fruit is very low in calories and contains no cholesterol, and is a rich source of phyto-nutrients, minerals, and vitamins. Lots more reasons to enjoy papaya than just its sweet flavor and pretty orange color! I had previously enjoyed this tropical fruit in my Papaya Salad, so this time I decided to create a tropical inspired salsa to top some salmon we were grilling that evening. 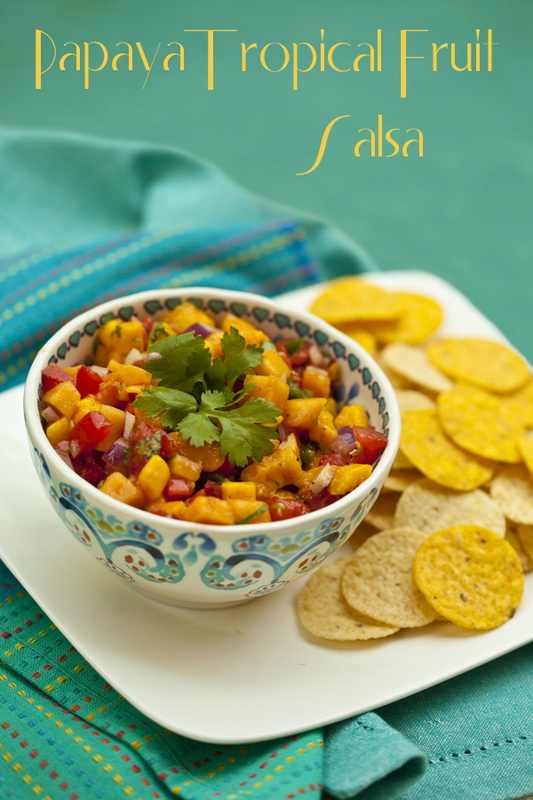 For this recipe, I used my usual basic salsa ingredients of tomatoes, onions, jalapeno pepper, and cilantro, then mixed in some diced red pepper, mango and lots of diced papaya. A squeeze of lime, salt, pepper, and just a drizzle of olive oil and I had a delicious salsa that we used on our salmon. This salsa is great to use to top grilled chicken or many types of fish, or snack on with baked pita crisps or whole grain tortilla chips. Low in calories, cholesterol free, papaya is a rich source of phyto-nutrients, minerals, dietary fiber, and vitamins. Mangoes are high in fiber, Vitamin C, Vitamin B6, Vitamin E, Potassium, Copper and Vitamin A. 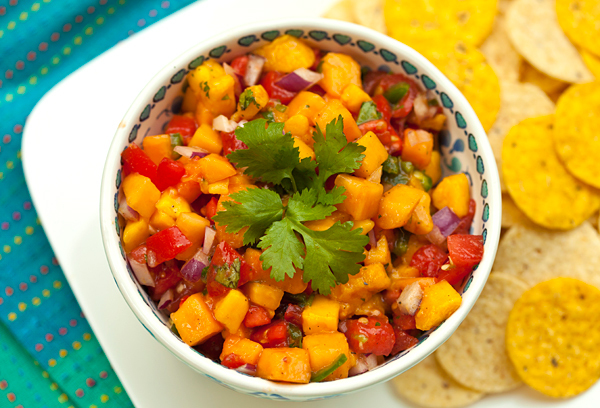 In a bowl, mix and gently toss together the papaya, mango, tomatoes, onion, jalapeno, bell pepper, and cilantro. Pour the lime juice on top along with the olive oil, and toss. Finish with a little salt and pepper and refrigerate until ready to serve.